©SMTPUB INC * Prices plus tax & tag. Prices include $499 Service & Handling fee. ** Limited Powertrain Warranty. Some vehicles are for illustrational purposes only. 2015 Nissan Titan Crew Cab, Auto, 4WD, #P-9325B $ 24,977 WARRANTY! NOW NOW NOW Was $26,977 Was $26,977 Was $26,977 2015 Toyota Sienna SE Sunroof, Nav., Alloys, Sporty, #T-14160A $ 25,977 SWAGGER WAGON! NOW NOW NOW Was $26,977 Was $26,977 Was $26,977 2017 Nissan Sentra SR Auto, Alloys, Sporty Gas Saver! #P-9375A $ 14,977 SHARP! NOW NOW NOW Was $15,977 Was $15,977 Was $15,977 2018 Toyota Corolla IM Auto, Alloys, 18K Miles, #P-9378A $ 16,977 WARRANTY! NOW NOW NOW Was $17,977 Was $17,977 Was $17,977 423-587-1972 423-587-1972 423-587-1972 5944 West A.J. Hwy. • Morristown 5944 West A.J. Hwy. • Morristown RustyWallaceToyota.com RustyWallaceToyota.com www.RustyWallaceToyota.com www.RustyWallaceToyota.com www.RustyWallaceToyota.com www.RustyWallaceToyota.com www.RustyWallaceToyota.com www.RustyWallaceToyota.com www.RustyWallaceToyota.com www.RustyWallaceToyota.com www.RustyWallaceToyota.com www.RustyWallaceToyota.com 2016 Nissan Maxima SV V6, Loaded, Warranty, #P-9412A $ 21,977 LOW MILES! NOW NOW NOW Was $22,977 Was $22,977 Was $22,977 2015 Ford Explorer XLT 4x4 Leather, Navigation, Warranty! #T-14098C $ 25,977 LOADED! NOW NOW NOW Was $26,977 Was $26,977 Was $26,977 2017 Jeep Renegade Latitude 4x4 Auto, All Power, Warranty! #P-9399A $ 17,977 4x4! NOW NOW NOW Was $18,977 Was $18,977 Was $18,977 2015 Infiniti Q50 AWD, Auto, Low Miles, Warranty, #P-9415A $ 20,977 LUXURY & LOADED! NOW NOW NOW Was $21,977 Was $21,977 Was $21,977 2016 Toyota Corolla S Plus Auto, Alloys, All Power, 28K Miles, #P-9346A $ 15,977 LOW MILES! NOW NOW NOW Was $16,977 Was $16,977 Was $16,977 2014 Chevrolet Silverado LT 4x4 Z-71 V8, 100% Cream Puff! #P-9348D $ 27,977 LOW MILES! NOW NOW NOW Was $28,977 Was $28,977 Was $28,977 2016 Toyota Highlander Auto, 3rd Row Seating, Warranty, #P-9388A $ 25,977 LEATHER! NOW NOW NOW Was $26,977 Was $26,977 Was $26,977 2016 Jeep Wrangler Sahara Unlimited Pkg., Leather, 6 Spd., Hard Top, #T-14073A $ 28,977 4x4! NOW NOW NOW Was $29,977 Was $29,977 Was $29,977 2017 Lexus NX200T Auto, Connected Nav., Leather, Warranty, 29K, #P-9433A $ 28,977 SHARP! NOW NOW NOW Was $29,977 Was $29,977 Was $29,977 2018 Toyota Corolla LE All Power, 7,000 Miles! Auto, Warranty, #P-9392B $ 16,977 LOW MILES! NOW NOW NOW Was $17,977 Was $17,977 Was $17,977 2017 Honda Accord Sport Auto, All Power, 29K Miles! #P-9391B $ 19,977 MINT! NOW NOW NOW Was $20,977 Was $20,977 Was $20,977 2016 Kia Sorento LX Auto, Alloys, Warranty! #P-9425A $ 18,977 LOW MILES! NOW NOW NOW Was $19,977 Was $19,977 Was $19,977 2013 Lexus 2013 Lexus ES 350 ES 350 2010 Ford 2010 Ford F-250 Lariat 4x4 F-250 Lariat 4x4 2016 Kia Forte EX Auto, All Power, Alloys, Low Miles! #P-9439A $ 14,977 MINT! NOW NOW NOW Was $15,977 Was $15,977 Was $15,977 2017 Hyundai Elantra SE Auto, All Power, Alloys, Mint! #P-9440A $ 15,977 SHARP! NOW NOW NOW Was $16,977 Was $16,977 Was $16,977 2016 Nissan Pathfinder SV 4x4 All Power, Alloys, 3rd Row, Warranty, #P-9430A $ 22,977 4x4! NOW NOW NOW Was $23,977 Was $23,977 Was $23,977 2017 Nissan Rogue SL Leather, Heated Seats, Warranty, #P-9438A $ 21,977 LOADED! NOW NOW NOW Was $22,977 Was $22,977 Was $22,977 2016 Toyota Camry SE Auto, Alloys, All Power, Sweet Miles! #P-9366A $ 15,977 RUN 4EVER! NOW NOW NOW Was $16,977 Was $16,977 Was $16,977 y y y y y To T eT ace lla y lace aceT t c oyota.co ota.co llaceToyota.co LOADED! Available, Nav., Blind Spot, Cross Traffic, Sat. Radio, Leather, Every Option Htd. Steering Wheel, Htd. & Cooled Seats, Sunroof, New Tires! #P-1234A DIESEL! Mint Inside & Out! Power Stroke & Lots of Extras! 6.4, Auto, #T-14385A $ 22,977 22,977 22,977 $ $ 17,977 17,977 17,977 $ 2014 Toyota Prius Hybrid, Fantastic Miles, Save on Gas! #N-13386A $ 12,977 50 MPG! NOW NOW NOW Was $13,977 Was $13,977 Was $13,977 2013 Toyota Sienna XLE Leather, 8 Passenger, Sunroof, #T-14479A $ 13,977 XLE PKG! NOW NOW NOW Was $14,977 Was $14,977 Was $14,977 2016 Toyota Corolla LE Auto, All Power, Ultra Clean, #P-9437A $ 14,977 WARRANTY! NOW NOW NOW Was $15,977 Was $15,977 Was $15,977 2015 Nissan Murano AWD, Alloy Wheels, All Power, #T-14316A $ 15,977 SHARP! 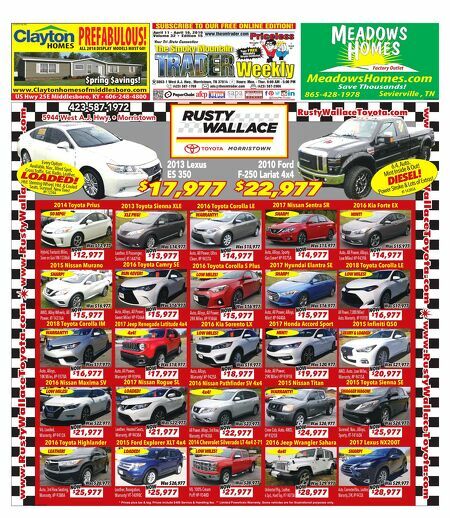 NOW NOW NOW Was $16,977 Was $16,977 Was $16,977 www.Claytonhomesofmiddlesboro.com US Hwy 25E Middlesboro, KY • 606-248-4800 HOMES ©SMTPUB INC ©SMTPUB INC Factory Outlet Save Thousands! 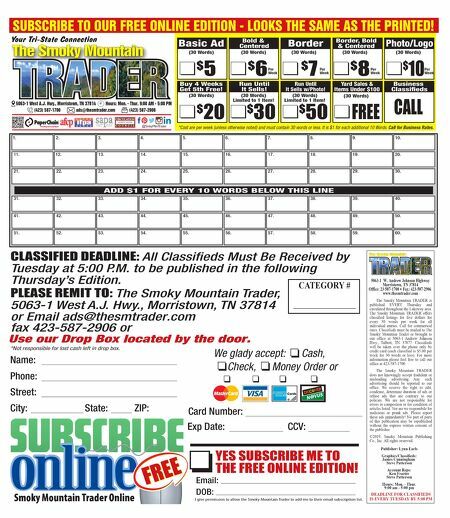 865-428-1978 MeadowsHomes.com Sevierville , TN Your Tri-State Connection April 11 - April 16, 2019 Volume 32 • Edition 15 Weekly Your FREE Bargain Connection! Weekly Weekly www.thesmtrader.com Priceless ads@thesmtrader.com (423) 587-1700 (423) 587-2906 Hours: Mon. - Thur. 9:00 AM - 5:00 PM 5063-1 West A.J. Hwy., Morristown, TN 37814 @SmkyMtnTrader ALL 2018 DISPLAY MODELS MUST GO! $pring $avings! $pring $avings! $pring $avings! PREFABULOUS! ©2019 The Smoky Mountain Publishing, Inc. SUBSCRIBE TO OUR FREE ONLINE EDITION!